In a week when about 18,000 Israel-focused attendees enjoyed lectures, lobbying and lofty speeches at the annual AIPAC confab at Washington DC’s convention center, more than 24 American rabbis and several hundred Jewish and other congregants attended three weddings of Israelis at DC’s Washington Hebrew Congregation on Tuesday evening. 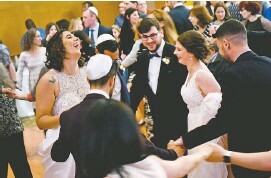 More than twenty congregations donated to fund the weddings, which were set in Washington DC, since the couples could not be married by the rabbinate in the State of Israel. The couples were Anat and Shmuel Carmel, Sahar Malka-Rabkin and Ilia Rabkin; and Tsion and Aviad Raz. Tsion and Aviad were unable to marry in Israel since they are a gay couple. The Rabkins were married in a Reform Jewish ceremony in Israel, which is not recognized. They did not want an officially recognized Orthodox ceremony due to its rules and ketubah language. Anat and Shmuel have been a couple for a decade and met in middle school in Israel. They were barred from marrying in Israel because even though Shmuel’s mother led an Orthodox observant life in Israel, she converted to Judaism in Romania as a young woman, but since she was deaf, it was determined – after her death – that the conversion was invalid and therefore Shmuel was no longer considered Jewish by the rabbinate. Much of the items for the event were donated or discounted, including the outfits, the challot, the wine, an Ashkenazi style klezmer band, the wedding cake, the caketoppers of six grooms and grides, and the custom ketubbot. Right on! The Orthodox in Israel cannot stand in the way of true love, and have NO RIGHT to say who is or isn’t a Jew. That is G-d’s call to make, His and NO ONE ELSE’S, no matter what! I wish all of the couples long lives filled with happiness. Mazel Tov!